Times & Dates: See the "add to cart" above, and click on the down arrow to see available dates. Class choices comprise of 4 days or two weekends or a combination training which are 8 AM to 6:15 PM in Eastern Time (ET) or Pacific Time (PT), unless otherwise stated. Please note that PT is 3 hours behind ET. You will see the teacher, whiteboard and the presentation slides. Class Description: This class provides 35 hours for exam approval and the prep you need to pass, which consists of 4 days of instruction, pmWorkbook, pmWorkbook Exercises' book, 16 in full color printed on durable paper, and a free 30-day Online Quiz Practice Subscription that starts on day 3. All classes are Guaranteed2Run at the time of purchase and there are no rescheduling fees. Instructor: Mo Haque, MSEE, MSEE, PMP, PMI-ACP, PMI-PBA, CMfgT, EDMP. Mo Haque is a brilliant educator, with a strong experiential background throughout his global project management career managing projects and programs where he used enterprise analytical techniques, analysis, and modeling to improve project management delivery through process automation, reducing overall costs and schedule. He is famous for his storytelling, workflows, and for making the seemingly difficult, simple. Those who have experienced his training, continue to come back to class for other training, never ceasing to be amazed of just how much wisdom and knowledge he is able to impart from so much experience. This is the time for you to achieve both explicit and tacit knowledge in abundance. When you take the PMP Exam you will know the answer because you will remember his stories. To See All Current Class Options: Please click on the down arrow. Call 360-584-8614. PMP Exam Application: You don't need a title of project manager in order to claim project experience. If you have questions regarding your experience send Nereda Haque, PMP your resume for review or call her at 360-584-8614. We also help you with your Exam Application on the first day of class so let her know if you have questions. If you qualify for Exam pre-approval before coming to class we will help you get the application done earlier upon request. You can also take this training if you already have exam approval, as this class prepares you to pass the PMP Exam. PMP Exam Alignment: This training is aligned to the PMBOK(R) Guide (The Project Management Body of Knowledge(R), Sixth Edition. The class is also aligned to the PMP Exam Outline. PMP Exam Fees: The first and second PMP Exams are not included; however, a 3rd exam may be included based on compliance activities. Ask for the PMP flyer which summarizes compliance activities. See below for exam pricing. Current or New PMP Exam Training Dates are Clearly Marked in the Menu: You will find choices for the current PMP exam, and the new PMP exam training in this menu. Take the exam within 15 to 30 days after training, making sure you have enough time to finish all the quiz practice (over 2,200 questions) or take it within your comfort zone. We highly recommend finishing all online quiz practice before taking the exam, for best risk mitigation. All Guarantees: Third exam guarantee (see compliance activities), free rescheduling, guaranteed-to-Run Classes (exception: acts of God), free resitting for up to six months. Also, if you take your first exam within 30 days and finish all PMP online quiz practice, you will also receive 2 more resitting opportunities (earned bonus time) in the last six months of your 12 months of exam approval. Free 30-day PMP Online Quiz Practice Subscription: Each trainee also receives a free 30-day PMP Online Quiz Practice Subscription starting on the 3rd day of class with over 2100 questions. You need to confirm that you received the quiz links on day 3 of class. If you need more online quiz practice time, it starts at $39 for 15 days and up. See PDU Details Below if you are updating your certifications. 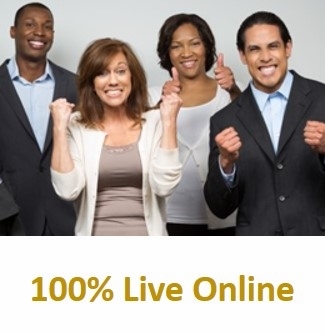 About 100% Live Online Training: You will need to have internet access in order to join. If you are joining from outside the 48 lower states in the US, then your quality of connection will depend on your internet speed. You are sent a link for training the evening before each day of class. You will need a headphone to participate in the training. We have had trainees from Australia that had good quality training. To Register For this PMP Class - Simply purchase your training or let us know that your are waiting or organizational training. U.S. Purchases: Please order at least 4 business days in advance so we can mail out your materials. If you are outside of the US, purchasing 10 business days in advance would be more prudent. Most shipping overseas will be somewhere around $79. Send us your address so we can get your a quote. Please purchase by Tuesday or Wednesday morning if you wish to join a weekend class and receive delivery Friday or Saturday via Priority Flat Box or let us know if you want overnight week day delivery and you want us to add $35 to your purchase. Call to pay over the phone if you need additional postage or shipping services. (2) If you are outside of the US or in the lower 48 states of the US: purchasing 10 days in advance may be more prudent. You will pay the postage amount minus the USPS flat rate box rate of $13.85. You will be provided a quote as well as a link to pay for the postage. Please email us first if you need full postage details before purchasing. There is no fee to reschedule or training. PMP Exam costs are extra - these are US Exam fees: $405 for PMI(R) Members and $555 for non-members. 2nd and third exams are $275 / $375. You will pay the Project Management Institute for your exam after you are approved. This is a complete class: There is no need to take a PMP Certification class, then a PMP Exam Prep Class. Knowledge, understanding and practice are key to passing. See some of our testimonials. �	7,500 hours over 60 months with high school diploma / equivalent, plus 35 hours of project management training. For further questions, please call Nereda Haque,PMP at 360-584-8614 (cell) or email her. Your PDU number will be determined by the class location, method of training or where it was hosted from, not by your purchase item #: For these combinations: We will use PDU # TRPM23-E6 for ET when hosted from DC and when the class is combined with onsite trainees in Washington DC; or PDU #TRPM48-V6 for PT when your class is hosted from Bellevue WA with onsite trainees in Bellevue WA, or TRPM24-V6 ET when the class is hosted from Troy, MI and combined with onsite trainees. If there are only online trainees, then it PDU number will be TRPM04-E6 for a class of online learners only. The PDU number will be on your certificate. We can only provide one PDU per class. If you have lost your certificate, then check back with us please. We will be happy to help you.